The dome in the left hand picture is an illusion! It was painted on the ceiling of the Jesuit church in Vienna by Andrea Pozzo a bit over three hundred years ago. Seen from just the viewpoint of the photo on the left, it’s one of the classics of trompe l’oeil painting. 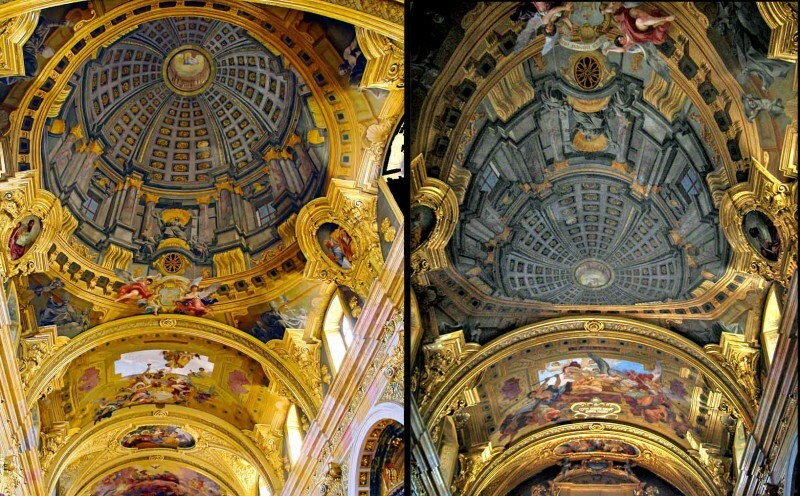 The right hand photo, looking the other way down the nave of the church, shows how Pozzo had to distort his painting of the dome, in order for the perspective illusion to work from a viewpoint near the high altar of the church, as in the left hand photo. (Copyright might be asserted in these images. Most of the images on this site are my own or out of copyright, and can freely be used for private, non-commercial purposes, but these are third party photos. Apologies, I don’t know who took them). Note added 16/5/17! I’ve added a post about a ceiling painting in the uk by an artist following where Pozzo led. I’m posting about the painting in Vienna to draw attention to a fascinating recent book in which Pozzo is featured. The effect of his paintings, especially in this church and in the Church of Sant’Ignazio in Rome, is almost magically illusionistic, and the book is about what conjuring and magic have to teach us about perception and the brain. It’s by cognitive scientists Stephen Macknik, Susana Martinez-Conde, with science writer Sandra Blakeslee: Sleights of Mind: what the neuroscience of magic reveals about our brains. The connection between illusions and conjuring has intrigued many researchers, but this is a ground-breaking published study. Macknik and Martinez-Conde (a married couple, each running a separate research lab) also founded the Best Illusion of the Year Competition, now in it’s seventh year. Im am currently preparing a lecture bout perspective and your material is very usefull with this.